The 2018 Allen Endurance Series kicks off this weekend with the Solent Forts race, hosted by Hayling Ferry Sailing Club. Starting in the entrance to Langstone Harbour, the long distance race around the Eastern Solent has the potential for the course to take in the iconic Napoleon Forts and the Nab Tower, depending on weather conditions. The race comprises of a number of legs radiating out from a gate (like a star), allowing the course configuration and length to be adjusted according to the conditions prevailing on the day. The race has a unique ‘time out’ feature that allows boats to take an optional 30-minute break during the race. This time may be used for a comfort break or for tactical purposes. There is a practise race scheduled for Saturday afternoon and the race is scheduled to start at 10.00 am on Sunday. GPS Tracking SailRacer will be providing live GPS tracking, allowing spectators to follow the action. The current weather forecast looks promising with sunshine and a good breeze. Of the advance entries there are a number of well known names from the cat world, including Will Sunnucks, chairman of the UK Cat Racing Association competing in his high-speed foiling Vampire, crewed by Mark Self. There is a strong F18 fleet, including Grant Piggott and Simon Farren. Simon Northrop crewed by Caleb Cooper will be looking to defend his title. For the first time fast dinghies are eligible to race, with top International Canoe sailor Gareth Caldwell looking to give the cats a run for their money. 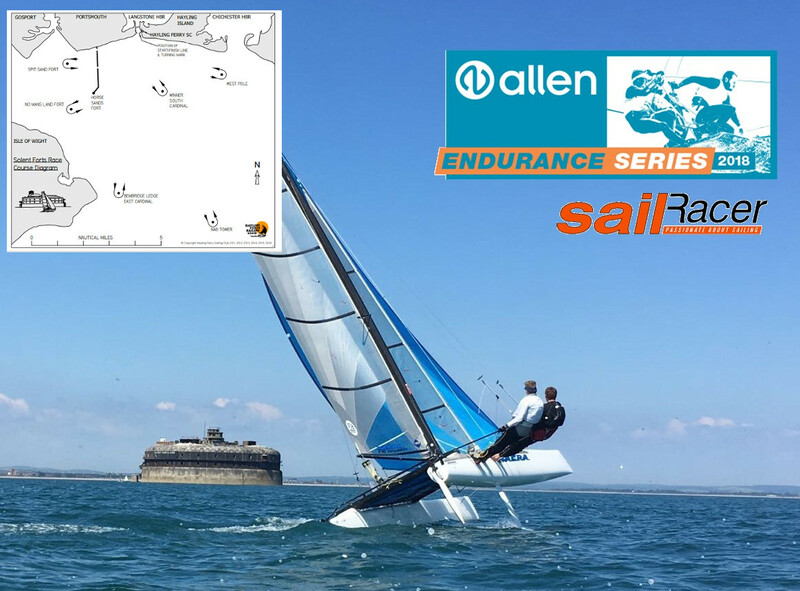 The 2018 Allen Endurance Series covers three of the UK's long distance races: Solent Forts, East Coast Piers and Round Sheppey. With racing covering over 120 miles, the Allen Endurance Series will challenge sailors over some varied courses to find the UK's top long distance racers this summer. All races will be tracked by SailRacer, allowing organisers and supporters to monitor boat positions, which will also provide a wealth of analytical data such as top speeds and distance sailed. Allen will be providing over £1,000 of prizes across the Series and individual events.